Welch Allyn Spot Vital Signs Monitor LXi : Medical Thermometers : ECG Equipment : EKG Machines : Pulse OX : Ambulatory Blood Pressure : Fetal Dopplers : Schiller Monitors : Medical Device Depot, Inc.
With more options and parameters than other spot-check devices, the Welch Allyn Spot Vital Signs LXi allows you to customize the device to meet your specific needs. Take vitals in about half the time as other spot-check devices with superior reliability. The easy to use layout improves your workflow and patient satisfaction. This model only includes Blood Pressure and Temperature. 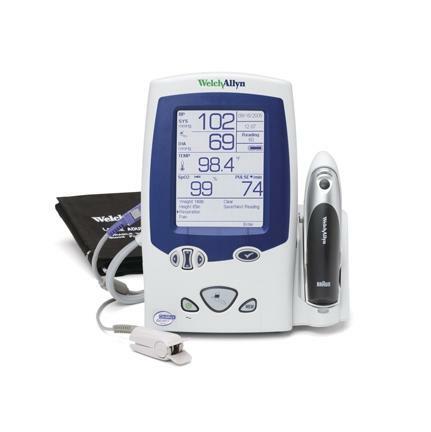 With more options and parameters than other spot-check devices, the Welch Allyn Spot Vital Signs LXi allows you to customize the device to meet your specific needs. Take vitals in about half the time as other spot-check devices with superior reliability. The easy to use layout improves your workflow and patient satisfaction. This model only includes Blood Pressure, SpO2 and Temperature. For more information or to have a demonstration in your office, please email sales@medicaldevicedepot.com or call 877-646-3300.